Born in 1911, in Northwood, Middlesex, Roger Hilton studied at the Slade School of Art from 1929-31, where he was taught by Henry Tonks and was awarded the Orpen Prize and Slade Scholarship. He then went to the Academia Ranson, under Roger Bissière, and, in the same year, to Atelier Colarossi, Paris. He returned to London and studied, in 1933, at the Academy Schools, before beginning to exhibit with the London Group two years later. Hilton continued to do so until 1951. He began teaching in Yorkshire, but only for a year, before moving to live and work in Paris in 1937. His work in this period was figurative, something which he largely abandoned in the 1950s. Hilton’s work was interrupted by the outbreak of war, and he joined up to fight with the Commandos for two years, becoming a POW in 1942. When he returned, it was to a year at the Central School of Art in 1945 (where he taught from 1954-6), after which he taught at various schools, was married, and had two more children, his first having been born in 1939. In 1950, Hilton both visited Cornwall for the first time and executed his first truly abstract work. The latter led him to be included, in 1954, in the seminal book Nine Abstract Artists. The former encouraged him, in 1957, to take a studio in Penwith, Cornwall. 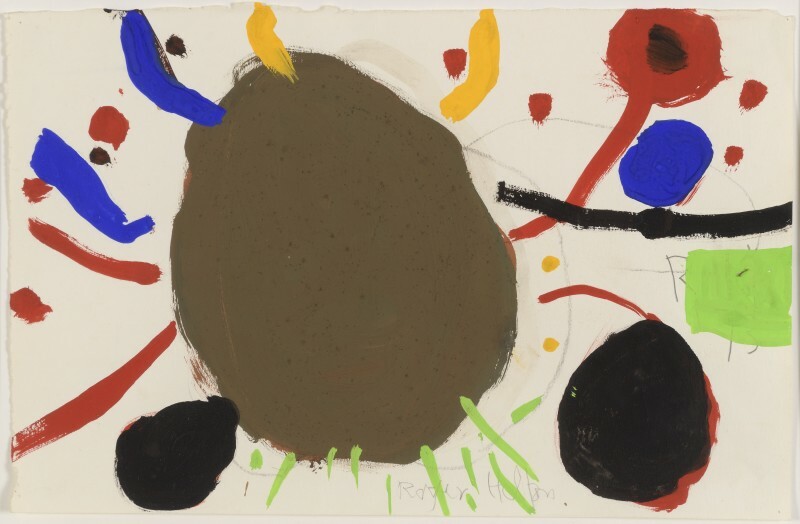 In the 1950s, Hilton turned to an abstraction that was inspired by the colours and forms of nature, which led him to be linked both to the Abstract Expressionists and to the St Ives artists. He had a significant retrospective at the ICA in 1958, along with several other major exhibitions. In 1963 he won the prestigious first prize at John Moores Exhibition in Liverpool. A year later, he represented Britain at the Venice Biennale. A year after that, he moved permanently to Cornwall. He remarried, having divorced his first wife. In 1968 he was appointed C.B.E. 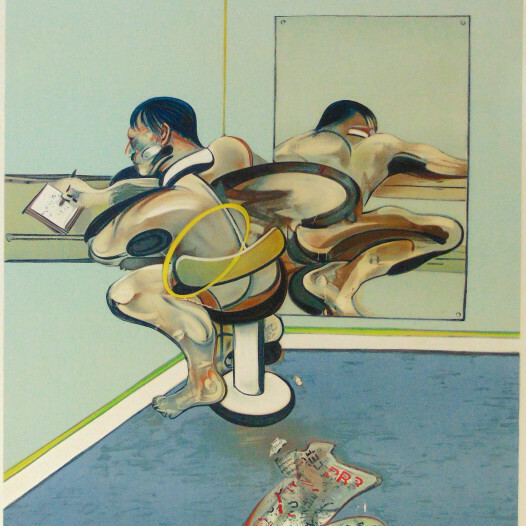 He continued painting, but his underlying alcoholism confined him to bed in the 1970s. 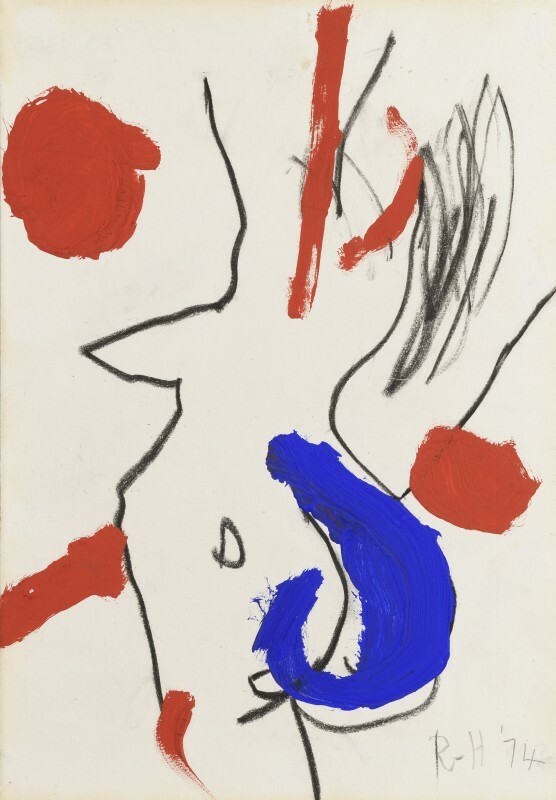 At Christmas in 1972, he took up his son’s poster paints and started to create works that were almost childlike, but subverted this effect with their subject matter and his definite treatment of line and shape. They showed the violence of his emotions, the fury at his older age, sexual decline, and invalid status. Sexual and animalistic imagery exploded across the paper in blunt, messy drawings, and figuration returned in the white heat of rage. This is relieved in works in which he recalled the joy of discovery and play found in childhood. In 1975, Hilton begun to decline seriously, dying a month before his birthday, in February. He is still well regarded, and his work is widely exhibited and held in many collections, including Kettle’s Yard, the Arts Council and Government Art Collections, the National Galleries of Scotland, and Tate Britain.